PLDS Lite-On EZ-DUB External Burner | OhGizmo! 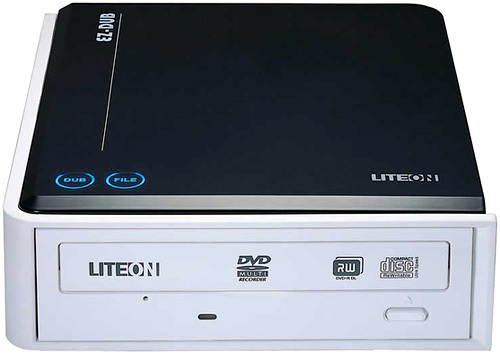 For the less than technologically inclined comes this external burner from PLDS (Philips & Lite-On Digital Solutions) that makes the act of copying or backing up files to a CD or DVD considerably easier. On the top of the burner you’ll find two touch sensitive buttons labeled DUB and FILE. Hitting the FILE button will bring up a simple application on your PC that looks like a large EZ-DUB icon. All you need to do is then drag files directly onto this icon and they will be added to a ‘to-burn’ queue. When you’re done you just hit the FILE button again, insert a blank disc into the tray and it will burn your files. Duplicating a DVD or CD is even easier. When you hit the DUB button it will ask you to insert the source media at which point it will automatically create an image on the computer. After that you just need to insert a blank disc and the image will be written to it. While experienced pirates users will probably find the interface lacking in options, imagine how much easier the process will be for all those family members who feel you’re the only person they can call for help. You should be able to find the EZ-DUB in stores now for about $80.